SCVHistory.com LW3339 | Placerita Canyon | Roy Rogers Stars in 'The Far Frontier' (Republic 1948). 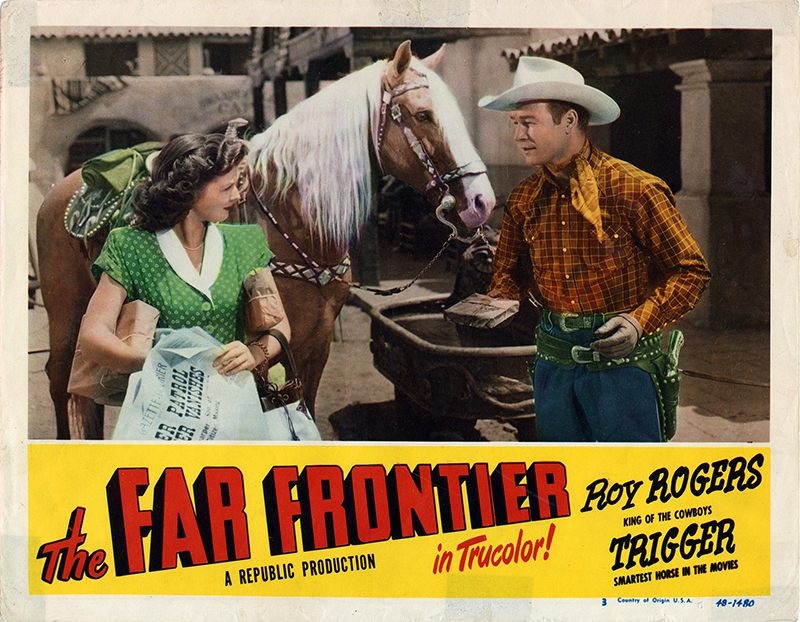 Roy Rogers Stars in "The Far Frontier"
Trigger got top billing over Gail Davis (future Annie Oakley) in Republic's 1948 Roy Rogers vehicle, "The Far Frontier." Lobby card, standard 11x14 inches, No. 3 of 8. Filming took place at the Walker Ranch in Placerita Canyon, Vasquez Rocks, and the Littlerock Dam in Pearblossom. Joe Yrigoyen, a nephew of Andy Jauregui, doubled for Rogers. Rounding out the cast are Francis Ford (John Ford's older brother), Clayton Moore (future Lone Ranger), Andy Devine, Roy Barcroft, Robert Strange, Mike Ragan, Lane Bradford, John Bagni, Clarence Straight, Edmund Cobb, Foy Willing and the Riders of the Purple Sage (Scotty Harrel, Johnny Paul, Al Sloey). Uncredited cast members are Stanley Blystone, Roy Bucko, Tom London, Emmett Lynn, Jack O'Shea, Keith Richards, Charles Sherlock and Ward Wood. David Sharpe doubled Roy Barcroft and Clayton Moore. LW3339: 9600 dpi jpeg from original lobby card purchased 2018 by Leon Worden.